Th-INK-ing of You: All creatrues, great and small... the Lord God made them all! All creatrues, great and small... the Lord God made them all! Hello everyone! It is time for ODBD Stamping In Time Challenge(SNTODBD26)! The assignment is Our Daily Bread Design stamps. Sarah Nelson is our challenge hostess this rotation. Sarah Nelson is challenging us to "All Creatures Great and Small!" All creatures great and small work for this challenge. So, without too much direction, we want you to interpret it the way you want. We look forward to seeing what you create using ODBD stamps! For my card, I used the ODBD set Noah's Ark. I stamped with Archival Sepia Ink and colored with Prisma Pencils and Odor Free Mineral Spirits. The base is Papertrey Dark Chocolate. The designer paper is The Paper Studio Mirabella Collection. I used Spellbinders Scalloped Edge Frame and Fancy Tags, and a MS edge punch for the lower green edge. I used TH Distress Ink in Pumice Stone to sponge around the image. I added some "white caps" to my water with a Galaxy Broad Point Marker in Milky White. The pearls are Recollections. Card is 5.5" square. We can't wait to see your submissions! Check out the Our Daily Bread designs Blog for all the details of the challenge and prize, and to link your card to the post! When uploading to on line galleries please be sure to use the key word SNTODBD26! Randi, Angie, Chrissy, Fran, Lorelie and Betty and don't miss Sara Nelson, our special guest hostess! Special Thanks to Sara for such a great challenge! Grace, this is so awesome! Your coloring and design are fabulous!!! Fantastic work as usual!!! Love ya, sister!!! Grace this is just adorable. Wonderful coloring. Fab card, great image & I just love the frame around it! Thank you for joining us at CES Challenge, Gingerloft & The Crazy this week, good luck! Girl - I love these layers and the colors - Beautiful coloring and design. Beautiful work! Hi Grace! I love your ark FULL of animals! Your coloring is just divine! I just wanted to pop over just posted a new card on my blog so I thought since I was on I wanted to come visit you. Each time I come and visit you just amaze me with the beautiful cards and creations you have done. sorry I have not been around much as you know I just has surgery a week ago so it is slow going. Grace, this is beautiful! Your coloring is fantastic...so detailed! Lovely card and design! What a super card. I love the image and it is so appropriate for my State of Queensland in Australia. Three quarters of the whole state is under water through floods. Such a devastation. Fabulous, Grace! So beautifully colored. This image is perfect for this challenge as are all your detials! Ohhh my goodness, this must have taken forever to color.... What an absolutely beautiful card! I just love the frame around the image, and of course your coloring is just beautiful too. thanks so much for joining us at Phindy's Place for our Distressing Challenge this week. Adorable card, Grace! I love how you often use so many various die cuts and edge punches. It adds wonderful design to your cards. Got a little time this morning to pop by and wish you a very Hppy and Siritually Posperous New Year Grace. I LOVE this card. My son's nursery was done in Noah's Ark theme, and everytime I see anything related to that part of the Bible, I think of that. This is so beautifully done, Grace! I love the look of the water...and the coloring of each animal...especially the lions! You colored the wood so beautifully. I love the bg papers. I especially appreciate the little piece of brown (I think) on the very bottom...it looks like another wave...very clever! 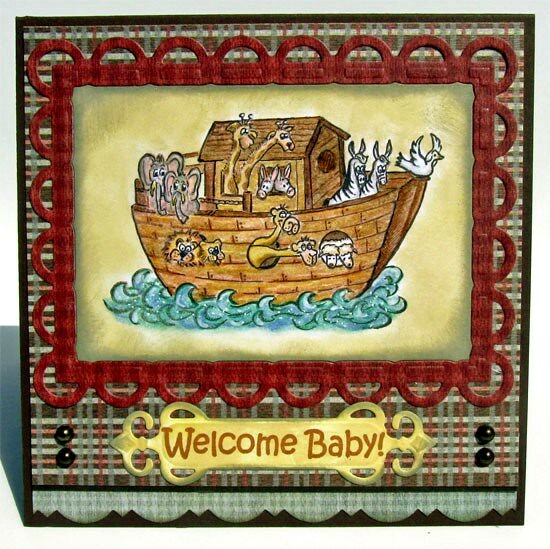 I love the piece of red-sienna colored trim directly around the ark and the vanilla paper. Is that a SpellBinders? Or is it ribbon? I love that piece! The whole card is wonderful, Grace. Give-away ends at midnight. Please, stop by, Grace! What a fun image, love those animals! Thank you for joining Quirky Craft's Challenge this week, New challenge starts Sunday, but right now it's time to vote for your favourite card and get all your blogging buddies to vote for you!! So hop over to Quirky Craft's! and vote!! Aw!! This is absolutely too cute!! Love your coloring and design!! Such a sweet baby card!! Great background and details. Gorgeous image, beautifully coloured and love the die cut frame. Thanks for joining in with the Crafty Cardmakers challenge this week. Thanks also for entering the card in the Crafty Creations challenge this week. Just perfect for our Chocolate Challenge at My Time to Craft and Card for a Child at OSCC! A very warm, bright and toasty card. Many thanks for playing along with Fab'n'Funky Challenges this week. Love your ark and animals, I need to dig my stamp out and do this one. Your work is always fabulous. I've been MIA, hubby very sick, please keep him in your prayers.